Our July E-News is Here! Exciting Sudbury Update, Summer Celebration, Meet the Service Staff, and more! EXCITING UPDATE: BBH Awarded State Funding for Phase 2 of The Coolidge at Sudbury! 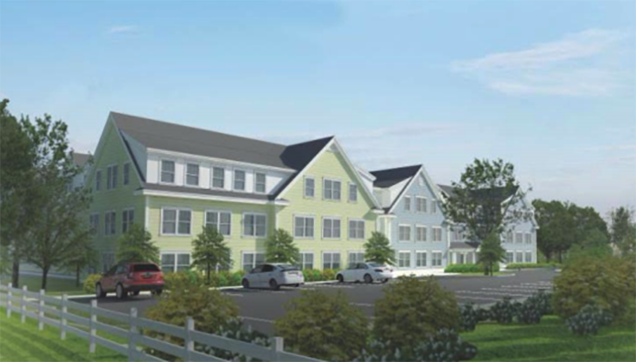 Left: Rendering of B’nai B’rith Housing’s Phase 2 of The Coolidge at Sudbury, a 56-unit affordable housing development for seniors. 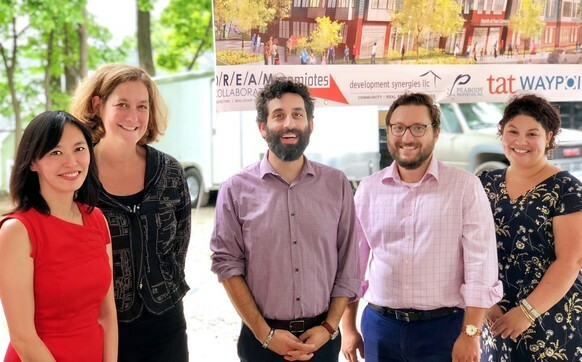 Right: DHCD Undersecretary Janelle Chan with B’nai B’rith Housing Executive Director, Susan Gittelman, Senior Project Managers, Jesse Kanson-Benanav and Max Glikman, and Fundraising & Communications Manager, Naomi Levine at Wednesday’s event. On, July 25th, Governor Baker and Undersecretary Janelle Chan of the Massachusetts Department of Housing and Community Development (DHCD) announced their 2018 annual affordable rental housing funding awards and B’nai B’rith Housing’s Phase 2 of The Coolidge at Sudbury was one of the 19 funding recipients! We are incredibly honored and grateful to have this commitment from the state. Many thanks to all of you who sent letters of support included in this funding application – we couldn’t have gotten here without you! And we also want to thank the Town of Sudbury for its ongoing commitment to providing a quality, affordable option to area seniors, many of whom have lived in the Sudbury area for their entire lives. In the next few months we will be announcing when we will be breaking ground on Phase 2. Look for more updates soon and thank you again to all of our friends and supporters. Celebrating Summer at Covenant House! What separates BBH’s senior housing from other affordable housing models is its commitment to building a community for its residents. Providing on-site resident service coordinators, ensuring access to fitness facilities, and promoting health and wellness are priorities. But bringing our residents together is the key to fighting isolation and depression in older adults and this is why our the social events we host are so important. 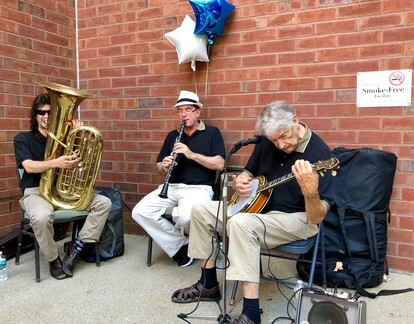 On Friday July 20th, the Covenant House properties hosted its annual Summer Barbeque. 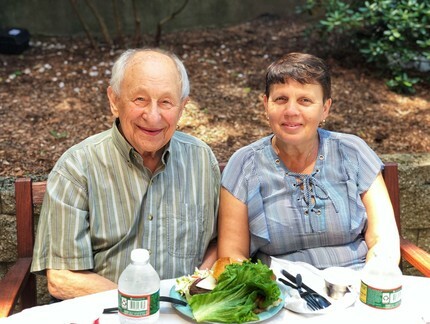 Staff members and their children, served Covenant House residents plates piled high with hot dogs, burgers, grilled chicken, potato salad and coleslaw. Tables were set up under shady umbrellas where everyone enjoyed listening to and dancing to live music by The New Wolverine Jazz Band. 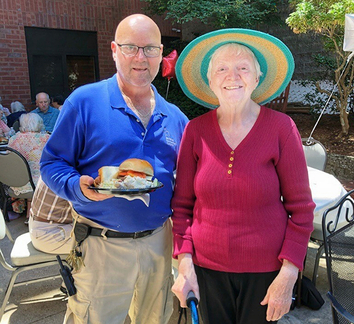 The Summer Barbeque is a festive and joyous celebration of the season and of the diverse community that calls the Covenant House properties home. At BBH, we pride ourselves on our award-winning service-enriched senior housing, but we couldn’t do it without our amazing on-site Resident Service Coordinators and property staff. This month, we are using the enews to say ‘thank you!’ to Peggy Golden and Julie Benoit, of our management and service staff from The Coolidge at Sudbury. Peggy Golden, who came to The Coolidge with close to three decades of experience as a property manager, was immediately struck by the high quality facilities and friendly residents of The Coolidge. “It’s rewarding to be part of a place that invests in the quality of life of its residents and gives them a home they can take pride in.” Fostering camaraderie is paramount to Peggy’s work and she enjoys helping residents access the services they need to thrive. Julie Benoit has taken to her role at The Coolidge like a fish to water! With a professional degree in social work and experience that includes being a recreation director at a large retirement community, Julie strives to help residents “live with their best quality of life possible.” Julie provides a listening ear and steadfast support for residents while always working to keep them engaged in the community by maintaining a robust fitness and activities calendar. 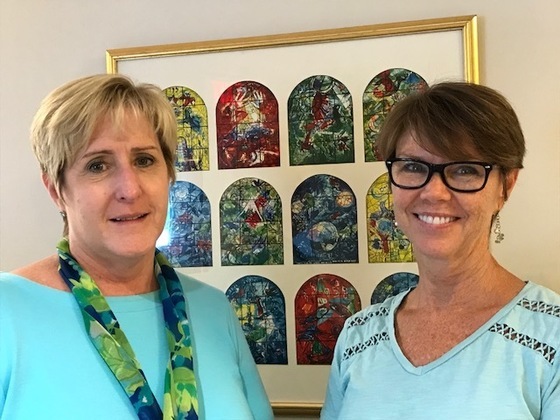 Everyone at BBH is so pleased that both Julie and Peggy find their work at The Coolidge fulfilling and are incredibly thankful to them for their contact efforts to improve the lives of residents at The Coolidge. In her latest Banker & Tradesman op-ed, BBH Executive Director Susan Gittelman highlights innovation in modular construction and its potential to be part of the solution to creating the housing that we so desperately need..
Click here to read Susan’s June op-ed. What is a YIMBY you ask? YIMBY is short for “Yes In My Backyard” and is a national, grassroots movement of people advocating for more housing choice. Community organizers, political leaders, educators, and everyday people are joining this movement to identify problems and create solutions that advance housing on local, state, and national levels. For the last few years, YIMBY advocates from across the country have come together to share ideas and resources. Dubbed ‘YIMBYtown’, this three-day event is coming to Boston this fall and being organized by a group of local YIMBY enthusiasts, including BBH’s own Senior Project Manager, Jesse Kanson-Benanav, and Gen2Gen Steering Committee member, Callie Clark, of MHP. Boston YIMBYtown’s goal is to establish a model of organizing that builds bridges to new allies, promotes racial diversity and equity, and wins campaigns to build more housing to meet the critical need in the Greater Boston area. We B’nai B’rith Housing will be at YIMBYtown and hope you’ll join us there! The conference will provide a great opportunity to connect with others from our region, across the country, and even the world (members of London YIMBY will be in attendance!) who share our commitment to ending the housing crisis. Updates coming soon on conference events and forums – we hope to see you September 20-23! Click here to learn more about YIMBYtown. Click here to read Susan’s 2017 YIMBY op-ed. Click here to read more about BBH Senior Project Manager, Jesse Kanson-Benanav’s part in the nation YIMBY movement.